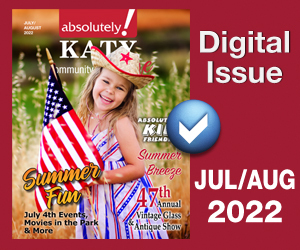 absolutely!™ Katy Magazines is published by absolutely! 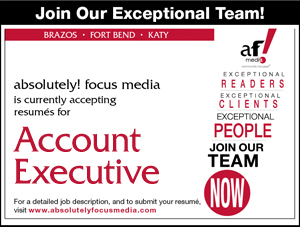 focus media, 4655 Techniplex Dr Ste. 700, Stafford, TX 77477. Copyright © 2018 by absolutely! focus media. All rights reserved. Reproduction without permission is strictly prohibited. absolutely! Katy ™Magazines does not knowingly accept false or misleading advertising or editorial, nor do the publishers assume responsibility should such advertising or editorial appear. 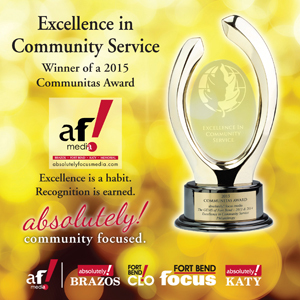 absolutely!™ Katy Magazines welcomes editorial submissions from its readers.